The strategy introduces stable components of flu virus to the body to spur universal, and long-lasting DNA-enhanced protection. The vaccine strategy introduces stable components of flu virus to the body's dermal layer to spur universal, and long-lasting DNA-enhanced protection. Getting a flu shot every year can be a pain. One UW Medicine researcher is hoping to make the yearly poke a thing of the past with the development of a universal vaccine that would protect from all strains of influenza virus, even as the viruses genetically shape-shift from year to year. The research in Deborah Fuller’s lab uses a DNA vaccine to instruct the individual’s own skin cells to produce antigens and induce antibodies and T cell responses to fight the infection. Her most recent research on this effort was published today in PLOS ONE. “Relatively speaking, DNA vaccination is the new kid on the block with regard to the types of vaccines,” said Fuller, a professor in the Department of Microbiology at the University of Washington School of Medicine. This year, U.S. medical professionals expect a challenging flu season, with 7,000 confirmed cases reported nationwide by the end of November – double the number from last year at the same time, according to the Centers for Disease Control and Prevention. The DNA vaccine in Fuller’s lab was engineered by using genetic components of influenza virus – the conserved areas – which do not change. This is one way Fuller’s DNA vaccine gets around the genetic drift, or changes, that occur in influenza strains from year to year, and challenge clinicians who combat the disease. It is also administered through the epidermis with a “gene gun” device that injects the DNA vaccine directly into the skin cells. The cells then produce the flu vaccine and prompts the body to create antibodies and T-cells to fight infection. The vaccine developed by Fuller’s lab takes a different approach to attacking the influenza virus within the body. Instead of simply repelling the virus, as on-the-market vaccines do now, this vaccine seeks out infected cells and kills them. The T-cell responses against the virus were so swift and complete in the tested non-human primates that they simply did not get sick, she said. Fuller’s team also was able to direct the T-cells to go to the lungs first, where much of the damage of an influenza infection occurs. Another advantage: This approach requires production time of about three months, whereas it typically takes about nine months to produce the U.S.-approved vaccine for a flu season that begins in December (in the United States) and runs through February. Fuller firmly believes this is the new direction of vaccine research. A “universal” vaccine would eliminate the need for yearly flu vaccinations and could be on-hand for rapid deployment should a deadly pandemic strain of the virus emerge. The idea of a DNA-based vaccine might also pose a mechanism for vaccines for other viruses, such as Zika, and for possible pandemic outbreaks which might emerge in the future, she said. But don’t expect the vaccine in Fuller’s lab to appear on the drugstore shelves anytime soon. It can take five to 10 years from the time a vaccine shows promising results in the lab to commercial availability. In the Fuller lab, senior research scientist, Jim Fuller, engineered a vaccine that contained DNA coding for viral proteins from four different influenza A strains. These proteins, called HA, are targeted by standard vaccines and are known to trigger a strong immune response to each individual strain. In addition, the vaccine included DNA for a protein that is highly conserved and, thus, shared across different strains of virus. Because DNA vaccines often fail to generate a strong immune response, the researchers sought to boost the vaccine’s effectiveness by fusing the DNA for some of the antigens with DNA proteins from a bacteria, a toxin from E. Coli, and protein from the hepatitis B virus that are known to be antigens that elicit a strong immune response. In an animal study in cynomolgus macaques, researchers in the Fuller lab, Drs. Merika Treants Koday and Jolie Leonard, found that after three doses, the DNA vaccine generated a strong antibody response against each of the flu strains it targeted. Antibodies bind to and help clear microbial invaders, preventing an infection from taking hold or reducing its severity. More importantly, the vaccine triggered a strong cellular immune response that was effective not only against the strains covered by the vaccine but also strains that were not. Deborah Fuller was the co-inventor of the gene gun used in this research, and co-founded Orlance, Inc. a startup which is working on engineering a clinical version of the DNA vaccine delivery system and commercializing it for vaccines, including influenza. 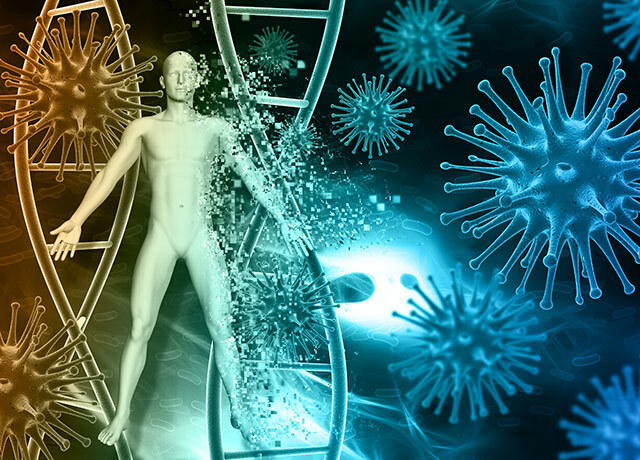 This project has been funded by National Institutes of Health, National Institute of Allergy and Infectious Diseases (https://www.niaid.nih.gov) NIH/NIAID U01 AI074509 to DHF; NIH/NIAID, Department of Health and Human Services under Centers of Excellence in Influenza Research and Surveillance (CEIRS) (http://www.niaidceirs.org) contract HHSN272201400005C; and NIH/ORIP P51OD010425-51 to WaNPRC. The funders had no role in study design, data collection and analysis, decision to publish,or preparation of the manuscript. UW Medicine writer Michael McCarthy contributed to this report.